Ballet Arizona has an incredible history as well as a respected reputation in American ballet. They are an inspiring success full of the finest dancers and continue to showcase outstanding performances. Despite many unexpected turns, the company has still risen to the top standards. In September 2000, the company very nearly closed down due to severe debts. Luckily, they survived due to a funding campaign which was a close escape, but let them go on to gain successful part in the ballet of America. The company first began because of a lack of funding in three three other companies - Phoenix Ballet, Arizona Dance Theater, and Ballet West Arizon. These three companies were smaller and struggled to survive alone. So in 1986, Allen Rosenberg merged the companies to form Ballet Arizona. Rosenberg was not a dancer himself, but an arts supporter so the company was first directed by two people, Jean-Paul Comelin and Malcolm Burn. The two directors were both previous and successful professional dancers themselves. Jean-Paul Comelin danced with Milwaukee Ballet and Stuttgart Ballet, then Malcolm Burn danced with New Zealand Ballet. However, it was Comelin that guided the company to its initial success, because Burn left very soon. Until 1992, Comelin ran the company when Michael Uthoff took over as the artistic director. The company continued to develop well until they hit financial trouble in 1999. By September 2000, they only just managed to avoid getting shut down. However, Ib Andersen became the artistic director in May 2000 and he reshaped the company to greatly increased their repertoire. Andersen introduced works by the renowned George Balanchine and produced works of his own choreography. Andersen has embrace his position ever since and was joined by Kevin Myers to head the administrative division. The company became free of debt and now continues as it likes to do best - create, perform, and teach outstanding classical and contemporary ballet. 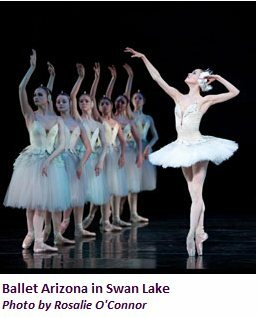 The School of Ballet Arizona gives training at the highest level and offers many performance opportunities for young dancers. The school found it's first director in 1993, which was Kee-Juan Han. Ib Andersen is now the artistic director for both the company and the school, along with Nancy Crowley also leading as the director for the school. The company have a very impressive repertoire that would attract any classical ballet dancer. They perform the director's versions of the great classics, such as Romeo and Juliet, Swan Lake, and The Nutcracker. As well as the superb Balanchine and other recognized choreographers including Christopher Wheeldon, and Twyla Tharp. With such a wide range of performances to offer and an incredibly rich history, this company is most definitely a unique talent of success.